If you’ve been tasked to pave the floors of a busy school, library, hospital, or other public building, we’re sure you’ve seen the wide selection of flooring materials and designs to choose from. At Hydro-Lazer, we too offer everything from laminated and ceramic flooring to fritz and slate tile. 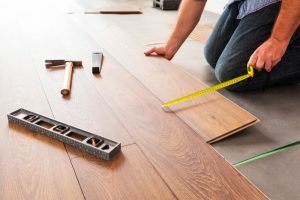 For flooring that is fated to experience heavy traffic for many years to come, what are some of the best materials to use that will stand up to the endless punishment without needing much maintenance? Here are four of the best materials we’ve worked with. Perhaps the undisputed champ when it comes to durability, porcelain tile can be cut by a waterjet in a myriad of ways to create beautiful designs that will last. Porcelain is built to withstand pressure and excessive wear and tear. It’s also extremely resistant to moisture, scratching, and staining, making it a breeze to sweep or mop clean. When you want the elegant look of stone and a floor that can withstand the elements, you don’t have to look anywhere else but porcelain tile. If you’re looking for a warmer color palette for your building, you might consider laminate flooring. Available in a variety of colors and designs (especially those designed to look like hardwood), a laminate is durable, affordable, and simple to keep clean. Better yet, replacing old flooring with laminate is a breeze, as it can be done without adhesives. If you’re looking for a safe alternative to tile and laminate where falling or slipping may occur regularly, you might consider rubber flooring tiles. Available in many different colors, textures, and thicknesses, rubber is easy to clean, resistant to fire and water, and resistant to heavyweight (you won’t have to worry about rubber not bouncing back). Linoleum is a flexible and natural material perfect for almost any type of flooring. Water-resistant and simple to clean, linoleum flooring can last for decades without warping or discoloration with the right maintenance. You can also mix and match colors for creative designs and logos perfect for business or public building entrances. Next time you face a custom flooring design challenge, choose Hydro-Lazer to water cut the perfect floor inlay. We guarantee it will look fantastic and last for years to come. Contact us today with your ideas, and we’ll get started right away.